I inherited the party bug from my parents. I recall that during their parties, Mom and Dad would march us seven kids in to play our instruments and sing. I think we each earned a quarter in exchange for those performances. Not bad for a non-union, late-60s era gig, I suppose. My parents had many guests over between parties as well. Sometimes my dad’s co-workers, other times just small socials and mixers made up of Mom’s and Dad’s extensive friend network. We had no dull moments growing up! When an HIStalk reader asked me to comment on how to accelerate work relationships and break down silos, partying was the first thing that came to mind. I’ve carried this tradition into work and home. While Julie is more into hospitality as I am into entertainment, parties and fun times with friends reside in our blood. Hardly a weekend night passes where we are not out dancing or hosting some sort of get-together. Clearly, there are many techniques to building work relationships. Since you can download a book and get routine ideas, I will focus on methods less talked about yet in my wheelhouse, because I love to party. Yes, I party with my work peers and subordinates. I can hear the naysayers and I respect you. I can assure you from personal experience over the years, partying has made a positive difference in business outcomes as well as employee engagement. Plus, it’s fun. Life is too short to work with dull people! Here are some ideas. I’d love to hear yours. Please comment below so we can all benefit. Not all will be applicable, but we won’t know if something works unless we try it. Be brave! Monthly after-work socials. Who: managers and above. One Thursday per month, we hit a city (rotate) in our sprawling metroplex and get to know one another in a relaxed setting. Typically, we visit 2-3 venues and the first round is on me. Everyone knows the rules. People are responsible for their behavior during this voluntary social and getting wasted is discouraged. We are so hurried at the office that there’s little time for informal chitchat; this relaxed venue allows for real engagement. Annual cheese, wine, and chocolate party. Who: directors and their significant others. Dress code: a step above casual. We’ve hosted six of these parties at our home. This fellowship has a two objectives, one social and one training. Some of our directors have officer-level career ambitions. This offers exposure to a new culture and a safe environment in which to practice new skills. Annual Christmas party (non-office setting). Who: direct reports with their families. We host this event in our home as a gift to those who serve me directly. December is way too busy, so we schedule this for the first weekend in January. 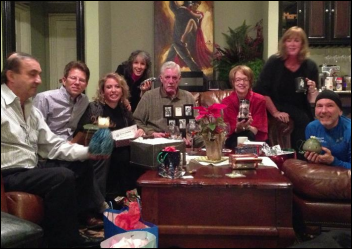 Our white elephant gift exchange has produced some interesting and memorable … stuff. Annual leaders’ family barbeque and swim. We rotate the location of this summertime event at one of our director’s homes. Kids and significant others are the focus. We eat lots of food and chill while the kids—and a few brave adults—frolic in the pool. You want to engage your team? Engage their kids! Sports (all unofficial due to liability.) Soccer teams, Ironman triathlon teams, mountain climbing teams, etc. Not everyone participates, of course. These are simply additional examples of outside-the-office party opportunities. After every adventure race, we have a line for our guest shower before the celebrations begin. Manager and director thank you party. We did our first one of these in January. A gift from Julie and me, it is an opportunity to say thank you to my entire leadership team and their significant others. Email is OK and I love thank you cards, but having everyone over and showering them with love is yet another way to engage at a deep level. My success is largely attributable to their leadership so we are quick to have everyone over and splurge. Special events. As needed. Last year, we won the Davies Award, so we hosted a professionally catered dinner for everyone who made this happen (including significant others.) Additionally, we invited the president of the EHR software company we used to come reinforce the magnitude of the achievement. Personal parties. We have several parties throughout the year and we often include many from work (peers, staff, etc.). These include birthday parties, game nights, and theme parties. We have “The Great Gatsby” coming up next week. I suspect that 25 percent of our guests at personal parties are from the workplace. Recognition events. 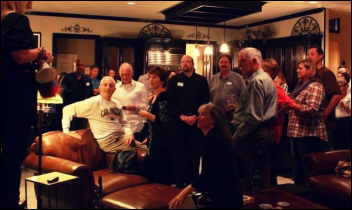 Directors have access to our home to use as a party venue for their teams. Some of them use our home for team-building events, some use it for parties, and others for special recognition for projects well done. While many of the examples above stress managers and directors, over 50 percent of my entire department has been to my home at least once for some sort of party. Dallas City Lights. This monthly event involves friends in all of my circles, but again includes about 25 percent from the workplace. I choose a different location each month and we all meet up. February we went country and March we hit the Glass Cactus, where part of the dance floor was reserved for our group. We danced to ‘70s music until they turned the lights off at 2 a.m. In May we hit an infamous ‘80s-only venue. Dancing takes center stage at many of these gatherings. Other peoples’ parties. I accept most the invitations I receive. Many traditionalists suggest maintaining a big border between work and play. Leaders should not engage or otherwise be transparent with the teams they lead. I disagree. I found great success by being transparent and opening up my heart and home to those I lead. Together, we have accomplished tremendous things, and I attribute a large part of this because of the level of engagement we have achieved. We know one another deeply. We know spouses. We know children. We know our joys and our hurts. When we know deeply, we care deeply. When one of us is injured or needs help, my joy is seeing many rush to walk with them, even carry them if needed. I’m thankful for the times they carried me. 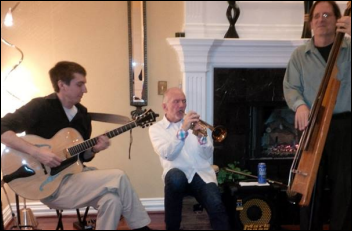 And yes, when our kids were younger, we marched them out to entertain our guests. There was Brandon the Magician and Tali the singer. Memories!